Taking a page from Agile concepts, my board has five lists: backlog, next week, this week, today, and done. New, non-time sensitive ideas land in the “backlog.” Every Monday, I move items into the “next week” and “this week” lists. I don’t assign due dates to tasks unless they are truly time sensitive (like mailing rent). Every morning, I move the tasks that I think I can complete from “this week” to the “today” list. When I finish a task, I move it to the “done” list. The next Monday, I review what I accomplished last week to gauge my “task velocity.” Finally, I archive all the cards in the “done” list and the cycle begins again. This system has helped me sharpen a skill that developers notoriously lack: time estimation. 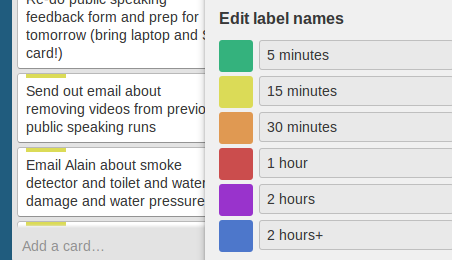 I assign each task on the board a label based on its estimated completion time: 5 minutes, 15 minutes, 30 minutes, 1 hour, 2 hours, or 2+ hours. These estimates help me plan how much I can take on each week and each day. Over time, these estimates have become more accurate and have helped me better plan the miscellaneous tasks in my life - which means fewer broken promises, fewer late arrivals because I am caught in the middle of a project, and much more timely rent payments. I still don’t complete all tasks on time, but I’m a lot better than I used to be. Like Agile stories, these estimations also help me evaluate the tasks themselves. A task that clocks in at 2+ hours is a red flag: It is probably too large to ever get done. When that happens, I try to break it into smaller tasks or revise the task to be less ambitious - anything else invites procrastination. Using Trello for my personal to-do manager has been fun and effective. With its help (and a little more personal discipline) I get more done in less time now than I ever have before. The little burst of dopamine after moving a task to the “done” list is a good reward, but it’s easy to get fixated on it. Early on, I would sometimes feel frustrated if I didn’t accomplish anything on a given day, even if it had been well-spent with friends and family. I try to remind myself that maximizing the number of cards in my done column isn’t the key to my personal happiness. Ultimately, the ability to visualize your time as a limited resource may be the greatest benefit of a personal to-do manager, as it challenges you to think twice about how you spend your time. Trello is the first tool that worked for me, and I recommend it to anyone without hesitation.